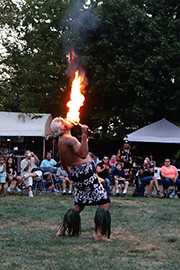 The 23rd Annual Harvest Pow Wow thrived amid the exceptionally hot September weekend temperature which soared to the high 90’s. 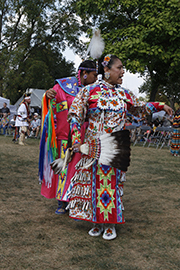 Many agreed it was the best Harvest Pow Wow sponsored by Midwest SOARRING Foundation in recent years held at the Naper Settlement. Both Saturday and Sunday’s schedule included a large array of Native American dancers dressed in full regalia and dancing to the drum beat of Milwaukee Bucks, Little Thunder with the Medicine Bear Singers, and Red Line. The audience filled the arena seating three times over the course of the weekend to watch the dramatic Grand Entry led by Veterans carrying the flags, followed by long line of colorful dancers. City of Naperville, Mayor Chirico greeted the audience and helped hand out medals to Veterans. Throughout the weekend event, both the MC and dancers encouraged onlookers to join in the arena dancing. A crowd pleaser for all was the potato dance where participants balance a potato between their foreheads and step in rhythm with the music. The last couple to keep the potato balanced between their foreheads, without using their hands wins. Later Polynesian dancing and Aztec drumming and dance performances honored Mother Earth. A children’s dance featured a quick scramble for candy in the arena circle. Interspersed throughout the day was colorful exhibition dancing that included the the group Snake Dance, Jingle Dress, Fancy War , Grass Dancing, Fancy Shawl, Traditional Dancing, and other specialty dances. A new and popular attraction this year was a supervised archery range for children, busy with eager participants both Saturday and Sunday. Exclusive to the Harvest Pow Wow was Apache the Mustang, who was present for families to pet and observe. Flintknapping (making an arrowhead) and Native themed arts and crafts activities as annual activities were family favorites. Imaginations were kindled with visits to the large red Tipi complete with authentic Native American implements and designs. Finally, S.O.A.R., (Save Our American Raptors and Deshka the American Bald Eagle) entertained families with close encounters with Raptor birds. Special guest and Native American actor William Strongheart represented the non-profit organization CANA at the Harvest Pow Wow. CANA rescues wild horse family groups and places them on Native American tribal lands. Strongheart mingled with pow wow attendees, spoke about his work with CANA, and signed the drum which was auctioned off. Other non profit organizations in attendance included the Nature Conservancy and the Utah Wilderness Alliance. The Nature Conservancy provided educational information regarding their conservation effort in the Midwest, which encompasses their own Bison herd as well as maps and directions to visit other bison herds in Illinois. The Utah Wilderness Alliance seeks to educate the public about the importance of protecting two wild Utah wilderness areas that include Bear Ears and Escalante Staircase National Monuments. Bear Ears encompasses over 10,000 ancient Native American sites and Escalante Staircase contains historic dinosaur bones important for archaeological study. Every year a unique shopping opportunity awaited Pow Wow visitors. Over thirty-five Native American themed vendors offered beautiful hand crafted pottery, jewelry, regalia, music, clothing, herbal salves and lotions and music. Families sat in the shade and feasted on Indian Tacos and hand squeezed lemonade, among other treats. In keeping with the inclusive spirit of the Pow Wow, new friendships were kindled. Pepsico, one of the Harvest Pow Wow sponsors, provided welcome refreshments of chips and cold drinks for all. 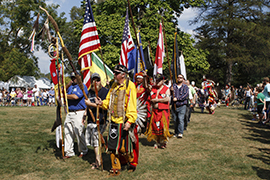 Plans are underway for the 24th Annual Harvest Pow Wow to be held September 23 and 24, 2018 at the Naper Settlement in Naperville. Midwest SOARRING Foundation looks forward to everyone participating in one of the most well- known pow wows in the state of Illinois. Scout groups, history lovers, veterans, families and the public are all welcome.